The FPT-5000 is a carrier class cellular fiber optic extender and repeater for CDMA, GSM, 3G, 4G* and AMPs. The unit converts RF signals to fiber optic for long distance transport and then converted back to RF. When used in conjunction with the RPT-9000 cellular extender, the FPT-5000 allows antennas to be mounted at distances not possible with coax and heliax cabling. Antennas can now be mounted kilometers/miles away from the RPT-9000 cellular extender. The FPT-5000 can also be used with other 3rd party RF devices and applications. Typical applications include areas obstructed by large buildings, hills, mountains and deep underground distances. 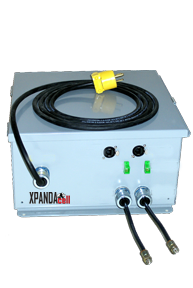 The FPT-5000 utilizes Fiber Optics to provide extension of Cellular RF signals which include CDMA, GSM and AMPs. By utilizing Fiber Optics, we extend the cellular RF signal without changing the original signal. This allows for clean and precise reproduction of original signal. Under normal circumstances, most antennas are connected to their transmitter/receiver with Coaxial or Heliax based cables. With the inherent loss in these types of cables, the distance is limited to under 150 meters since the distance of the link will diminish as the cables are extended. By connecting the transmitter/receiver RF signal directly into the FPT-5000 with a short coax cable and utilizing fiber optic cable to another FPT-5000, we can greatly extend the distance without a great deal of loss. In most cases this can be kilometers/miles. Some RPT-9000 cellular extender applications do not have line of site communications. There may be a large hill or object blocking site back to the cellular tower or you may need to provide service to the users with the same problem. By running armored fiber optic cable above or below ground from the RPT-9000 to either the Fill or Donor antenna, you can place the antenna in a location where you obtain line of site for either the cellular tower or users. The FPT-5000 allows the RPT-9000 to address these applications and problem areas. The RPT-9000 Hybrid contains and integrated version of the FTP-5000. Let the FPT-5000 be your solution. Call or email your XPANDAcell representative today.